The rank-and-file still have to ratify the settlement, but after that formality, they're good to go. It's another moment of brightness and hope, as teachers across America continue their one-year-plus streak of victories for quality public education for every child in the nation. 11% salary increase over 4 years. PLUS a 3% bonus upon ratification. We FORCED OUSD to invest in keeping teachers in Oakland – which will give our kids experienced teachers in their classrooms. Dramatic increases for subs, and tying sub pay to the wage scale, so our substitutes never fall behind again. MORE STUDENT SUPPORTS: More counselors, RSPs, psychologists, speech pathologists and Newcomer support staff for our students! Bonuses and a new salary schedule to support nurse recruitment. LOWER CLASS SIZES: A one student reduction in class size at high needs schools next year. A one student reduction in class sizes across all schools in 2021-22. We FORCED OUSD to take this step to improve student learning conditions, especially at our highest-needs schools. SCHOOL CLOSURE MORATORIUM: Board President Aimee Eng has committed to introduce a resolution calling for a 5 month pause on school closures and consolidations, and more community input into the process. 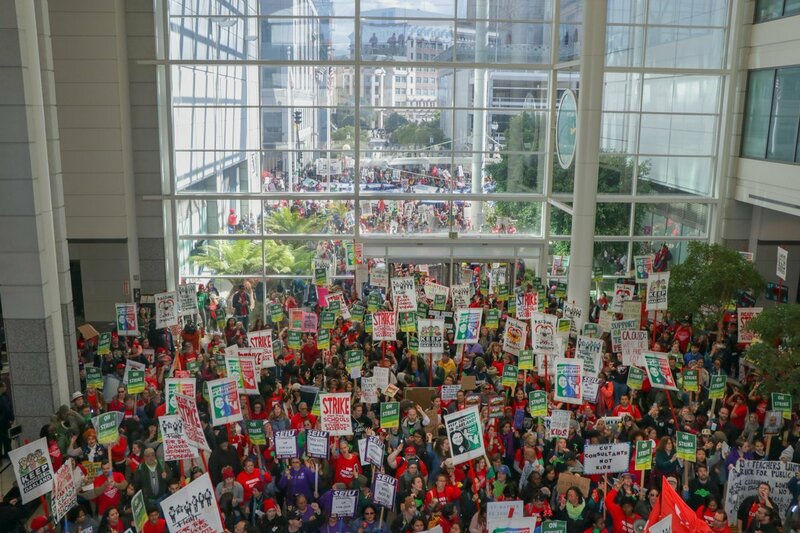 The power of our strike will help us organize against future closures! CHARTER SCHOOL MORATORIUM: Board President Aimee Eng has committed to introduce a resolution calling for a charter school moratorium, similar to the one passed by the LAUSD Board as a result of UTLA’s historic strike. Next step: Sacramento! Riley's Farm is a staple of Los Angeles overnight school trips (my daughter visited last year with her elementary school); it's an apple farm with a pick-your-own apples sideline that branched out into civil war re-enactments, with some students staying overnight in tents.